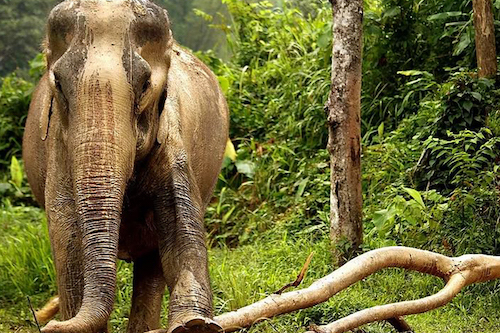 Phuket Elephant Sanctuary is a final home for retired working elephants, set on 30 acres of lush tropical jungle. 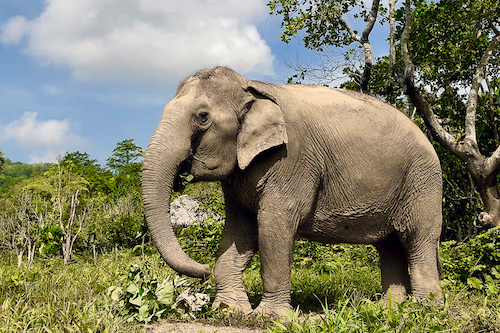 Observe how elephants rehabilitate into forest life after decades of abuse, and experience how incredible the largest land mammal on earth is during a day at our sanctuary. 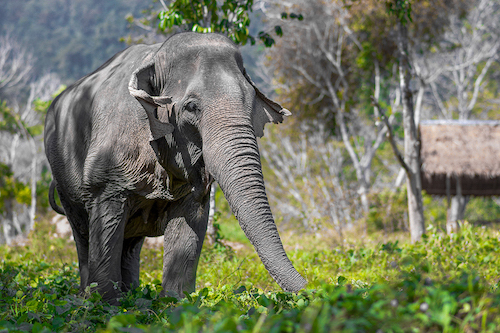 Bordering the Khao Phra Thaeo National Park, the Phuket Elephant Sanctuary offers a new home for overtired elephants who have suffered from working long hours in the logging and tourism industry. 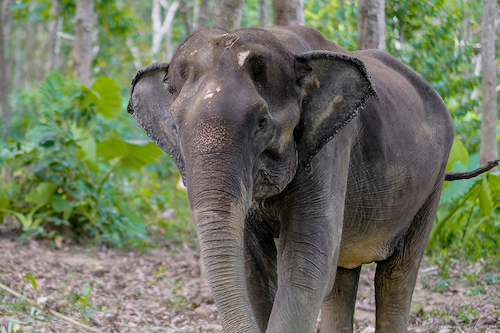 As the first ethical elephant tourism experience in Phuket, we rescue sick, injured and old elephants, welcoming them back into their indigenous habit. At Phuket Elephant Sanctuary elephants can just be elephants. Feed them pineapples and bananas, and observe these gentle giants as they enjoy their newfound freedom, socialize with each other and bathe freely in our expansive fresh water lagoons. Your visit guarantees to leave you inspired, transformed and in awe of these majestic animals. 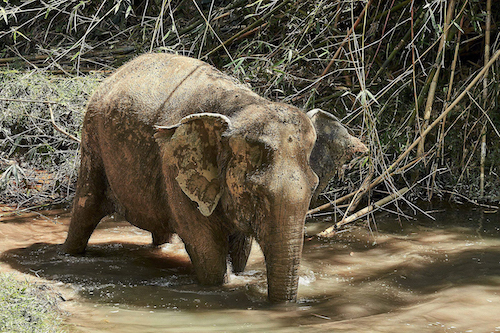 Elephants love to swim, cool off and splash in the water, and to cover themselves with thick mud. They like to do so alone or with fellow elephants. However, if people crowd around or interact with them during this bathing ritual, it becomes stressful for the elephants, preventing them from enjoying their time in the water and displaying their natural behavior. To give the elephants the privacy they need and to enjoy their day as much as you, we built an Observation Sala overlooking our fresh water pond, from where you can witness the elephants enjoying their bathing time alone or with other elephants. This is a great photo opportunity and educational experience as you can observe the elephants behave naturally. We do offer a brief interaction between visitors and our elephants during a feeding moment as part of the tour. This is a rare opportunity to get up close with the elephants and to capture some incredible photographs as they enjoy a few watermelons, pineapples, bananas or cucumbers. Introducing our beautiful elephants; get to know who they are, where they came from, and how they transformed into sanctuary life. 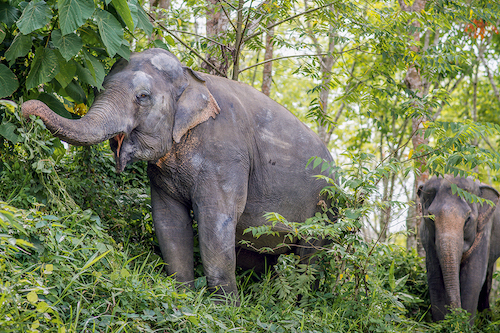 In October 2018, Cattleya’s previous owner contacted our mahout Benz, expressing his concerns for the well-being of his elephant. 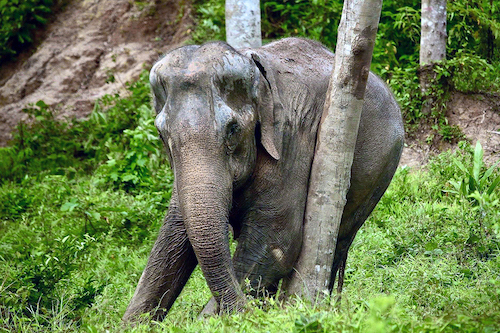 Sai Tong’s journey to Phuket Elephant Sanctuary started with a message from a visitor who spotted the poor elephant in February 2018, tied to a tree in the blistering heat. Named after the fragrant purple-blue flower, Sroy Fah (previously known as Tangmo) was rescued on Thursday, 8 February from a trekking camp in Phuket. 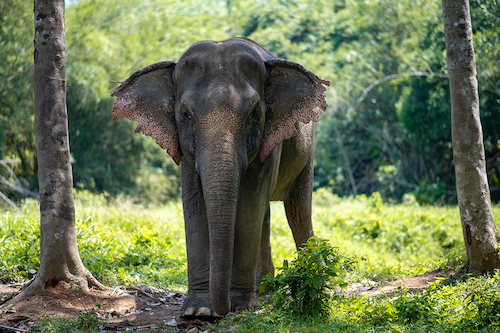 Richy was known as our “grandma” at Phuket Elephant Sanctuary. Originally from the Ranong province bordering Myanmar, she spent decades in the logging industry carrying logs as heave as her own body. the logging industry carrying logs as heave as her own body. Tong Kwaw means beautiful orange flower in Thai. 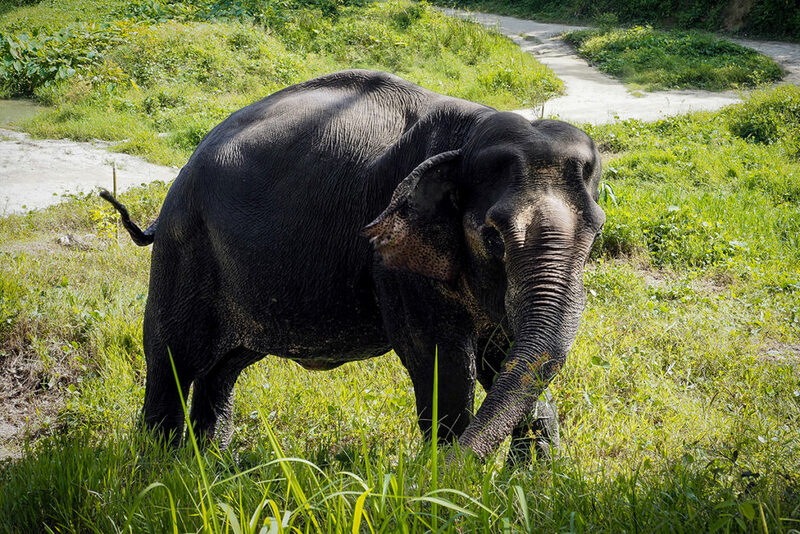 After more than 20 years of hauling and working in elephant riding camps, the 39-year-old elephant Tong Kwaw started her new life with us on December 15, 2017. Aside from the moon in Thai, Jan Jao is also the name of our lovely 40 year-old elephant at the sanctuary. Gaew Ta means “Darling”, and a darling she is! 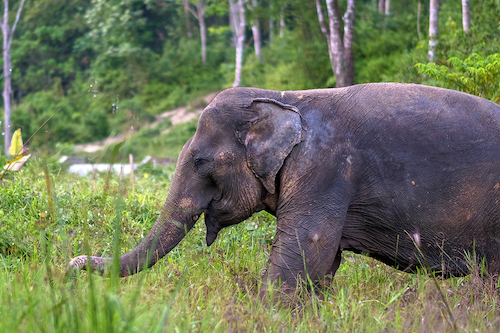 This polite, peaceful and beloved elephant is in her 50s and most notably, she is blind. Madee is a true gentle giant. Peaceful and calm, she is 69 years of age and together with Kannika the first elephant to call Phuket Elephant Sanctuary home. A 36-year-old cheerful, playful & energetic girl who loves to eat and is friendly to everyone who gives her food. Dok Gaew was one of the first elephants we welcomed to Phuket Elephant Sanctuary in 2016, and known for her kind spirit and bright shining eyes. Many elephant sanctuaries and camps in Phuket are pretending to be us. 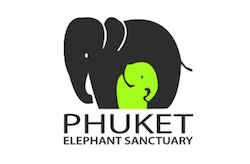 Always make sure you see our logo when browsing through websites or looking at brochures at your hotel or local travel agent, and insist to visit “Phuket Elephant Sanctuary in Paklok”. We are the first and only ethical elephant sanctuary in Paklok, Phuket, and not affiliated with any other elephant park or sanctuary on the island. 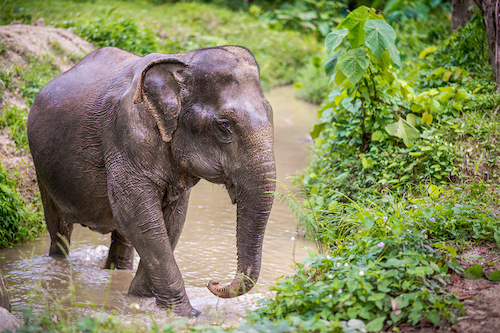 We look forward to welcoming you to Phuket Elephant Sanctuary, a final home for rescued elephants and the only ethical sanctuary in Paklok where elephants roam, bathe and sozialise freely.